The estuary is the well-known kite spot in the lagoon. Two launches are possible. One from Bom Successo beach (the safest one due to its wide sandy area) and one from Foz de Arelho. This Spot is opened to kitesurfing from September 15th to June 15th. It's forbidden to kitesurf on the left side of the red line during the beach season (June 15th - September 15th). This is an imaginary line going from the camping in Foz de Arelho to the restaurant located by the beach in Bom Sucesso. The inside of the lagoon offers great kitesurfing conditions during the summer. The Nortada (Northerly wind blowing on the west coast of Portugal during the summer) is reinforced by the nearby hills. This spot is opened to kitesurfing year-round. The waist deep waters make that spot the most suitable for the progression of beginners learning how to kite. You will find that spot at the end of a short sandy road accessible with any vehicle - just ask for the location via WhatsApp (+351 912 757 940), to make it easier to find us! The Obidos Lagoon (Lagoa de Óbidos in Portuguese) offers the best kitesurfing conditions year-round here in Portugal. 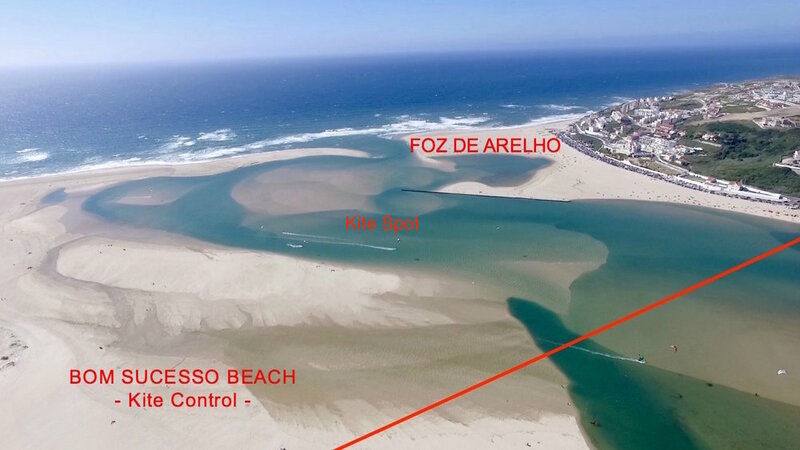 The secret spot where Kite Control kitesurf school is based is only a short drive from Peniche, Baleal and Obidos where, after your kitesurfing lessons, you can kick back and relax, enjoying the evenings by soaking up some local culture. Our kitesurfing school is located on a spot that boasts epic conditions for novices learning to kitesurf, while the ocean on the other side of the estuary offers perfectly peeling waves for surfing. Take your pick! Thanks to the local council’s continuous efforts to maintain the natural integrity of the landscape, this area not only remains clean and natural, but also quiet. The waters are not crowded and there is plenty of space within which to attempt to progress your kitesurfing. The tranquil inland waters are home to a variety of wildlife which can be enjoyed from one of the scenic walks. On the southern part of the lagoon estuary, the Bom Sucesso beach (where we are based) offers a wildlife trail accompanied with a spectacular panoramic scenery from atop of the cliffs. 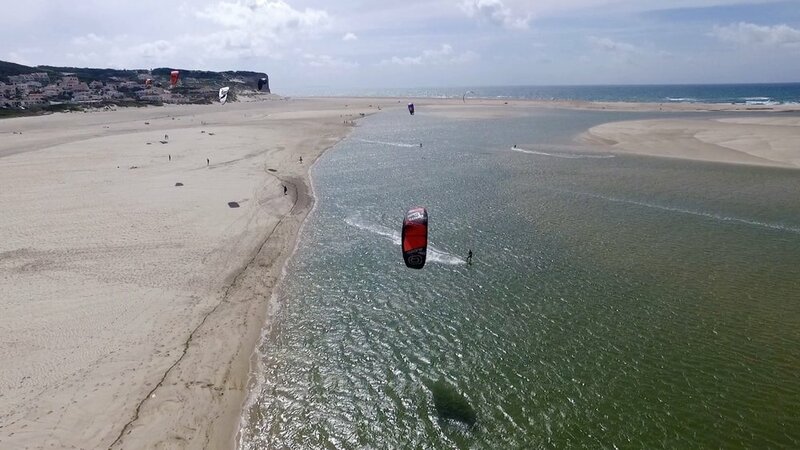 The Obidos Lagoon itself is home to consistent winds and butter flat waters; prime conditions for kitesurfing. After all, that's why we chose it! Excluding southerlies, all wind directions work on the lagoon; even easterlies are reinforced by nearby mountains. The high pressure system above Azores brings a north-westerly airstream along the coast, while the low pressure system over the Iberian peninsular serves to reinforce it. When both pressure systems coincide they work hand-in-hand to turn a light breeze into a strong, steady wind blowing parallel to the shore, with no chance of a change in direction. This is how the famous Nortada is being built. Mother nature at her best. The world class kitesurfing conditions to be found along the west coast of Portugal is undoubtedly one of the sport’s best kept secrets. Home to an abundance of world-renowned wave riding spots, Portugal has typically been seen purely as a mecca of surfing. Indeed, the coastal towns of Peniche and closeby Ericeira have, in recent years, been the setting for various world-famous surfing competitions. However, this sunny stretch of Portugal’s coastline is also inundated with vast expanses of flat water and wide sandy beaches, providing ideal conditions for novice and pro kiteboarding enthusiasts alike. Estuaries, lakes and coastal bays give shelter to those keen to go kitesurfing in more calm conditions, providing fertile ground for progression. During the summer months the northerly winds consistently deliver excellent kitesurfing conditions on a daily basis, providing calm, quiet waters on which to ride. These kitesurf spots are often only a short drive from the small but vibrant towns (such as nearby Obidos) that have become synonymous with Portugal’s poetic landscape, rich culture, and charming local customs. But even if Obidos Lagoon watersports are in high demand, Portugal is so much more than simply a kitesurfing destination. Locked into the traditions of living local, the people here have historically enjoyed a slower pace of life; a simple, elegant and humble means of living. This becomes imprinted on you when you visit this place. The problem is trying to hold onto it when you head back home. In the small, historic town of Obidos (an hour drive north of the capital Lisbon) one could get lost wandering the cobblestone streets, gazing into the distant past as they both taste and take part in the old customs and traditions still very much evident in Portuguese culture today. Coastal towns like Obidos, near Peniche, offer the world-class homegrown food & wine. For many living here this has become a staple of their livelihoods, sharing the knowledge passed down from previous generations and the produce from the surrounding lands with the flurry of tourists that visit this area of Portugal. Home to a thriving tourism industry boasting both luxury and more easily-affordable accommodation, one can find cheap car rental services and an abundance of family-run gourmet restaurants serving locally-sourced food and wine. Obidos has indeed become notorious for its delectable gourmet eateries and home-grown wines. A quick stroll down an ancient cobbled pathway and you may very well find yourself mesmerised by a local artisan hand crafting clay pots or a local musician entertaining diners enjoying their meal outside in the cool breeze. Due to the fantastic kitesurfing and surfing conditions and the somewhat idyllic nature of living on the west coast of Portugal, this area has become synonymous with kiteboarding enthusiasts in recent years. A comparatively cheaper destination than other well-known European tourist hot spots, cheap flights in and out of the country have aided the once quaint coast of west Portugal to become a burgeoning hub for adventure-seeking individuals and those looking for a more romantic getaway. Anyone in search of sunny shores, authentic local vibes, and a generally slower pace of life will find themselves at home. If you are searching for good food, comfortable accommodation and prime conditions for kitesurfing then we are convinced Obidos won’t disappoint. We are confident that you will enjoy your kitesurfing holiday here in the Peniche area, but we are also adamant that there is so much more to do in this charismatic corner of Portugal. Keep the family entertained with visits to nearby Lisbon… the epicentre of this vibrant country. Portugal has a lot to offer and we are here to make sure you make the most of your vacation here. See you on the water!